The unique beauty of owning your own motorhome means you have the freedom to travel to wherever you would like to go, and the freedom to travel at your own pace in your own time. You can choose to travel at a moment’s notice, pack up and disappear for as long as you and your party choose. Or, you can decide to spend some time planning the tour of your preferred destination and make details plans for your break. If this freedom is what appeals to you about owning a motorhome, why not extend this urge with the freedom to roam and go on a walking holiday? 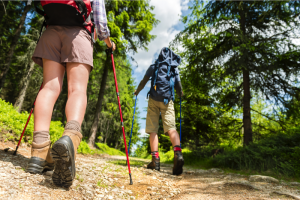 Using your motorhome as a base for your walking tour, you can go wild camping across the UK and walk until the only thing stopping you is the blisters on your feet. 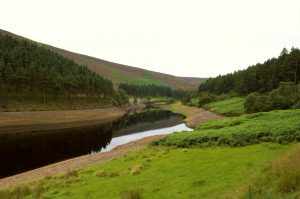 The Dark Peak, situated in the northern part of the Peak District is known for its desolate tracts of moorland top with extensive areas of blanket peat covered by cottongrass bog and heather moorland. There are some steep valley slopes that have been planted with blocks of coniferous and mixed plantation woodland, whilst other slopes support the acid grassland. Walkers suggest that you make for the Kinder Plateau. Begin at Edale, walk up Jacob’s Ladder and walk to the southernmost edge of the plateau before walking down to the Nab, heading back towards Edale. Or head south for Mam Tor, amble along the Great Ridge, the head back towards Hope. Originally ending at Cromer, Norfolk’s Coastal Path was extended to Sea Palling. The path now runs from Hunstanton in West Norfolk stretching around to Sea Palling on the north east coast. The walk takes in the region’s best views, including sandy beaches, windswept sand dunes, charming coastal villages, historical windmills, the centre of the county’s crab industry, Cromer and the famous seal colonies at Blakeney Point. Commencing at Bishop’s Castle, the walk follows in the footsteps of ancient drover’s trails along the ridgeways of the border with Wales. Linking in with sections of the Shropshire Way and Offa’s Dyke, the walk leads you towards the market town of Ludlow, passing thorough pastureland, castles sites and hillforts along the way. An 84-mile national trail that follows the UK’s most famous Roman monument. 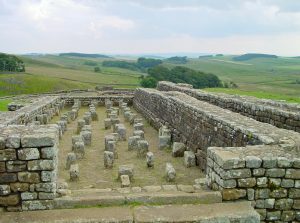 Hadrian’s Wall is estimated to have been built in under six years (all 80+ miles of it) by an extremely industrious army of 15,000 construction workers. Marvel at the history in this amazing achievement right in front of your eyes as to stroll past roman forts, settlements and the stunning borderland scenery. The isolated landscape of Knoydart, cut off from the UK mainland road network access is only available by boat or foot. Knoydart is in the Scottish Highlands and situated between the eerily named Loch of Hell and Loch of Heaven. Truly not for the faint-hearted and certainly not akin to a walk in the laid back countryside of flat terrains. Walking enthusiasts from far and wide come here to tackle the four famous munros and numerous corbetts. The Knoydart Peninsula is also home to the UK’s most remote pub (The Old Forge), just the right place for that “quiet pint” after a strenuous day trekking. A walk for the more experienced of walkers, this accessible 26-mile section of the Ulster Way is almost entirely off road. Starting at the foothills of the Mourne Mountains from Newcastle to Rostrevor on Carlingford Lough. The way takes in moorland, mountains and ancient woodlands with views of the coast and countryside in one walk, this unique mainly granite landscape is not to be missed. 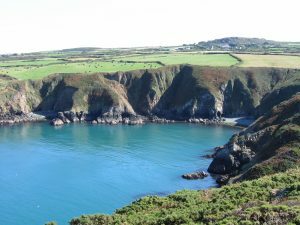 Originally opened in 1970, the Pembrokeshire Coast Path was the first of the National Trail network in Wales. In 2012, the path became a section of the Wales Coast Path, which is the world’s first continuous route along a national coast, stretching over 870 miles! Contained almost entirely within the Pembrokeshire Coast National Park, the path runs from St.
Dogmaels in the North down to Amroth in the south, covering an abundant variety of landscapes, including volcanic headlands, beaches, limestone cliffs, glacial valleys, sandstone bays and estuaries. The wildlife along the path is of note, with nature providing a stunning display of coastal flowers and bird life. If you are planning a walking tour, and plan to enjoy a short stint of wild camping as a part of your trip, it’s important to know that your motorhome is in perfect condition before you embark on your journey. If you feel that your motorhome would benefit from a service before you travel, or you have a repair that needs attending to before you go, you can be assured that Travelworld Motorhomes will be able to assist you. Motorhome servicing and repairs has always been embedded as an essential part of the Travelworld ethos. Our service centre has achieved NCC AWS (approved workshop scheme) accreditation, which demonstrates our focus on quality workmanship, high quality customer service and an investment in our workforce so they provide you, our customers with the highest quality service we can.